In the grand scheme of the Borough of London, Hampton is a very small place, not much bigger than a village really. However, it interconnects in all directions with other similar places like Sunbury-on-Thames, Hanworth, Molesey and Teddington. Just a bit farther afield are larger centres of population such as Kingston-upon-Thames, Staines and Hounslow, but for the sports fan, the choice is plentiful. The journey from the M25 takes you past Kempton Park if you like your Racing, whereas if you prefer bit of egg chasing, Harlequins, London Irish and indeed Twickers are all a kick for touch away. With the Thames virtually at the bottom of your garden, plus the various man made reservoirs, rowing and sailing is a popular pastime for those who have the cash, but if you prefer a bit of working class winter footy, it’s a great place to be. I’ve worked it out, from the A3 junction of the M25, you can get to Staines Town, Egham Town, Ashford Town, Bedfont Sports, Spelthorne Sports, Molesey, Hanworth Villa and indeed both Walton & Hersham and Walton Casuals within a matter of minutes. 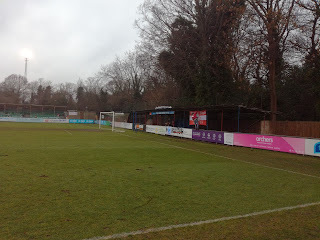 Today though was about a visit to the most senior ranked club in the locality, Hampton & Richmond Borough of the National League South, and not only that, a club that stand a very good chance of being in the top tier of non-league football next season with derbies against the likes of Woking and Aldershot Town to look forward to. The history of the club is an interesting one. 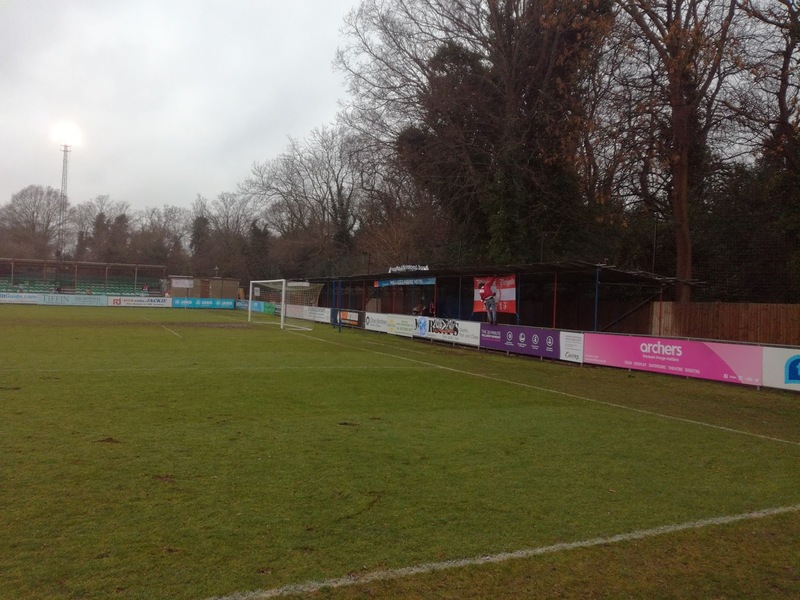 Known as plain old simple Hampton until 1999, they started out life in the Isthmian League in the early seventies, working their way through the divisions quietly and unspectacularly, adding the ‘Richmond Borough’ suffix in readiness for the turn of the century. With Alan Devonshire in command, they rose from the First Division of the Isthmian League into the Premier Division, where they came close to winning the title, but in 2007 they pipped Bromley for the crown on a nail biting final day of the season to reach the Conference South for the first time. 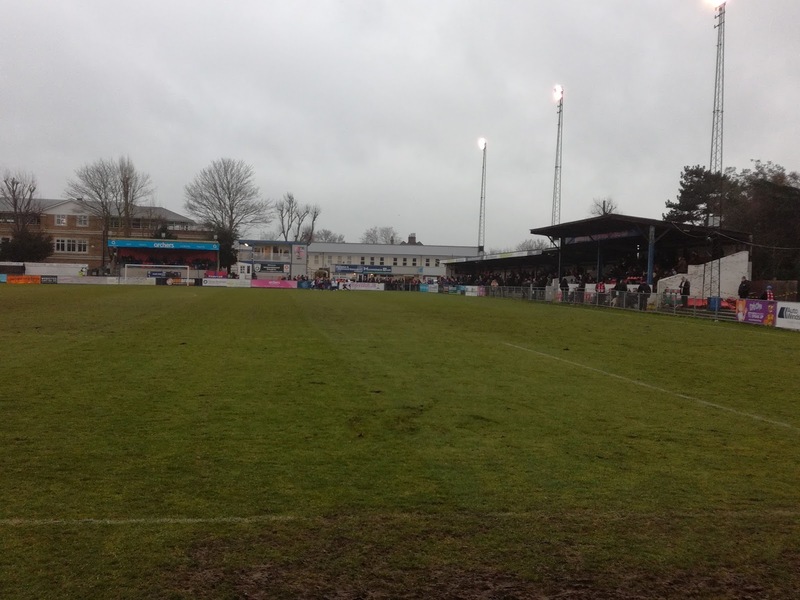 Two painful Play-Off Final defeats followed, and the club had success in the FA Cup, but Devonshire moved onto Braintree Town and the club then suffered a relegation back to the Isthmian League. They finally won their spot back in National League at the end of the 2015-16 season, where they have remained since, and at the start of today’s game, they sat second in the table. It was time to spread my wings and go and take a look. On a filthy day weather wise, games were falling across the Midlands and the North, whereas the South East looked to be getting away with it. The journey down to the M25 was a straightforward one, but the remainder proved to be a challenge. What was scheduled to be a 12.45pm arrival tuned into 1.35pm! As your drive along the A308 with Kempton Park on your left, it is very clear to see that this is without doubt one of the more middle class suburbs of South West London. With the Thames flowing to the right and its four islands partnering the Sailing Club and indeed slightly further on, Hampton Court Palace & Gardens, this was a very desirable place to be. Hampton itself as I’ve said isn’t a big place, in fact finding somewhere to park the car wasn’t straightforward, all the roads around the ground had restrictions so I had to make do with a five minute walk along Station Road, past its smart looking pubs, café’s and shops until almost the junction with the High Street where the Beveree stadium sits. 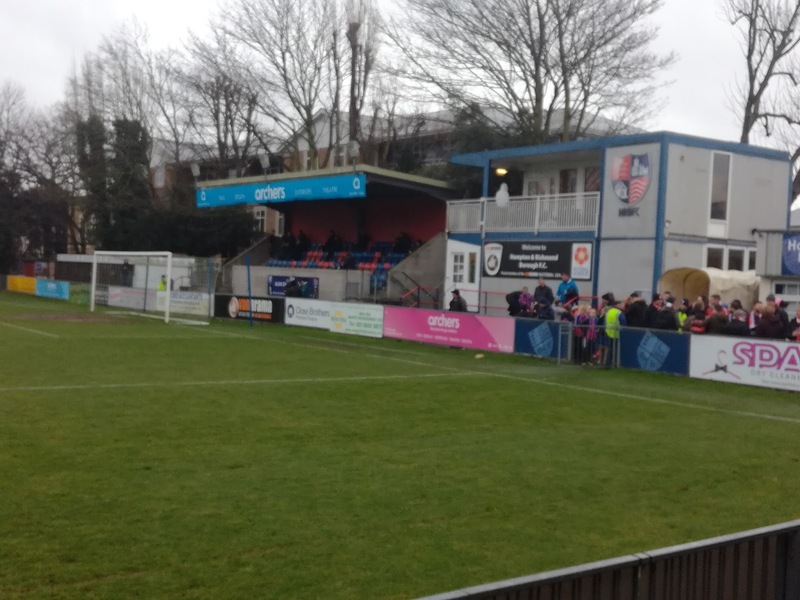 Firstly what a lovely location for a football ground, right in the centre of Hampton with lots of amenities and transport links available, but not only that, as you wind your way along Beaver Close to the home of HRBFC, what a cracking stadium it is. Unspoiled by the desire to simply satisfy the ground graders, it’s a gem of place, quirky in parts but a unique mixture of different styles and structures. 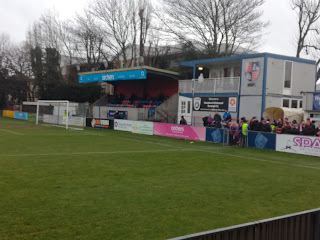 You enter in the corner and to the left is a long stretch of covered terracing that stops at the half line and joins onto a seated stand that contains the press area and the directors seats within it. Beyond this is another longer but slightly more shallow seated stand that runs to the touchline. 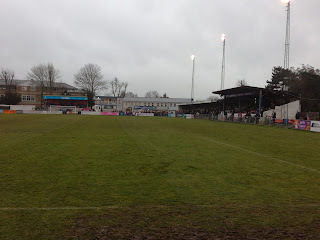 Behind the bottom goal is an area of covered terracing while on the High Street side it’s flat standing except for an area close to the top touchline that is a small section of covered terracing. The top goal end is a busy part of the ground. 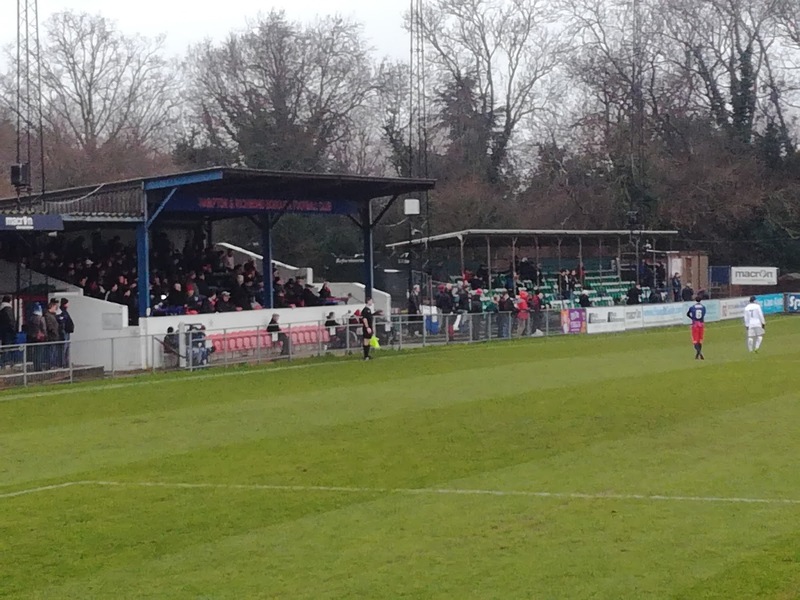 A tall, but not especially wide, seated stand provides fantastic views, while either side of it are small areas of terracing. To the left of it leading back up towards the turnstiles are the clubhouse and dressing rooms, plus a hospitality suite that allowed first floor open air viewing of the action. All in all, it was fantastic, and as I’ve been finding on my trips to the South East recently, a very friendly bunch. Visiting Whitehawk from East Brighton sat bottom of the league, but that only told half of the story. They were absolutely done for six weeks ago, but a recent upturn in form of a phoenix like nature has got them into a position that is still perilous, but they now have a small glimmer of hope of escaping the drop. You could be forgiven for thinking this would be a home banker, but the home supporters knew it was going to be far from easy against a side playing with a renewed confidence. 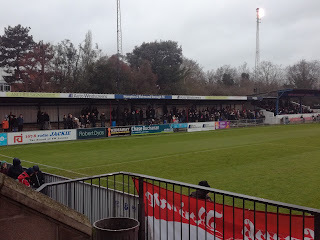 Of course, the eclectic band of Whitehawk fans made their presence known with their noise, their flags, their constant singing and support, and lets be fair, their ability to drink beer and keep the tills in the clubhouse ringing! I do like the lads and lasses from Whitehawk, ok, they aren’t your typical football fans, but what they are is a breath of fresh air, and very well behaved too. Having spent the first half in amongst them, I don’t recall a single word of bad language. They are openly anti-homophobia, anti-racism and anti-sexism, but they are also very much about family, with several children in the travelling party. I get the feeling they don’t mix well with Wealdstone though, which to be honest doesn’t surprise me in the slightest. Playable - Today At Least! 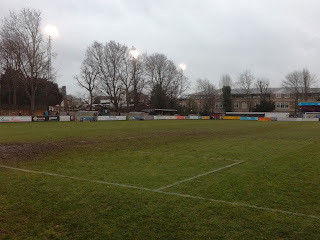 On a pitch that was wet but certainly playable, Hampton dominated the early proceedings down the slope, but couldn’t find a breakthrough, but as the Hawks settled and started to make inroads into the hosts territory, it was they who took the lead in the 34th minute when the well travelled and experienced Elliott Benyon guided the ball home. That rattled Hampton, and they equalised just after the break when an in swinging Josh Casey corner was grabbed by Hawks keeper Dan Wilkes yet he somewhat inexplicably carried the ball over his goal line. Standing right behind the linesman at the time, it was an easy decision for him to make, and to be fair to Whitehawk, their protests were not overly vocal. 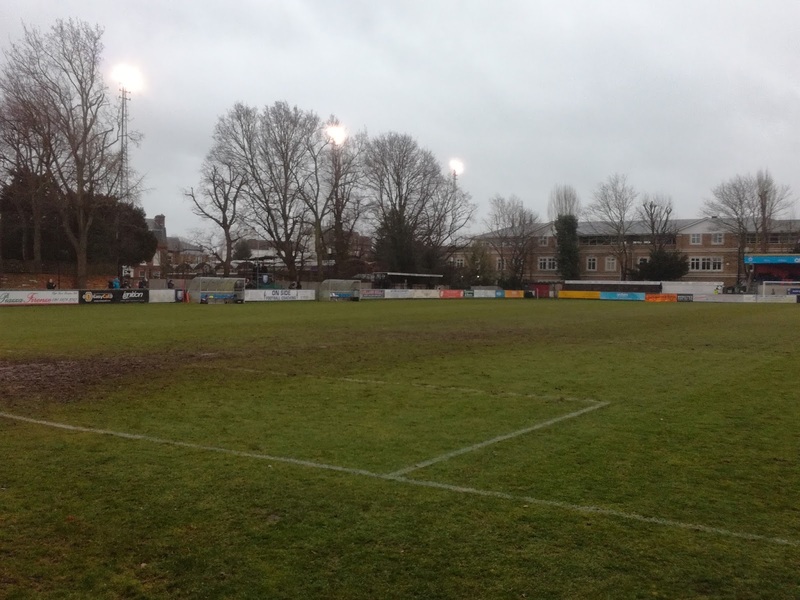 You did fancy Hampton to go on and win the game at this point but a red card was shown to Charlie Wassmer on the hour mark following a clash in the centre circle which didn’t help their cause. They did rattle a post and have plenty of possession, but with Yannis Ambroisine simply outstanding at the back for Whitehawk, they were happy with the point, and indeed as the game moved into added time, they could have sneaked a winner themselves with a bit more composure and luck. 523 paid to watch it, not huge, and not the best day weather wise, but let’s just remember that Hampton is not a massive place to draw from, and with lots of other clubs, sports and pastimes in the local area, fostering greater support is always going to be a challenge. A super club though, a great ground to visit, and a very nice location too. It would be great to see them in the top flight of the National League, but that brings with it different challenges, like increased travelling support and segregation for example. I’m not sure that’s the kind of thing that would sit comfortably with the gentile folk of Hampton. Plus, parking and such like could become a bigger issue. A lot of water to go under the bridge yet though, and canoes, and rowing boats, and sailing boats, and yachts……..